"This is one of my favorite recipes. Thin sliced eggplant is stuffed with cheese and spinach and topped with marinara sauce. I often use prepared jarred sauce to cut the cook time." In a shallow mixing bowl combine 3 eggs, 1 tablespoon garlic powder, 1 cup Parmesan cheese, Italian seasoning, salt and pepper. In a separate, shallow dish or plate, pour the flour. Heat oil in a large, deep skillet. Dredge eggplant slices in flour, then in egg mixture and fry slices 2 or 3 at a time in hot oil. Place fried slices on a paper towel lined plate to drain. In a large bowl combine ricotta, 1/2 cup mozzarella, remaining 1 cup Parmesan, remaining 1 tablespoon garlic powder, 1 egg, parsley and spinach; mix well. Spread about 1/3 of the pasta sauce in the bottom of a 9x13 inch baking dish. Place about 2 tablespoons of spinach mixture in the center of each eggplant slice and roll securely; place in prepared pan. 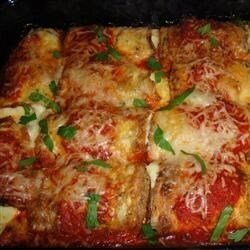 Pour remaining pasta sauce over eggplant rolls and top with remaining 1/2 cup mozzarella cheese. Get rollin’ into flavor with this zesty dish!